The first time I went to India in 1998, I fell deeply in love with the food. As a vegetarian at the time, I delighted in the lengthy menus with a small ‘non-veg’ section at the back, and couldn’t get enough of all things palak (spinach). 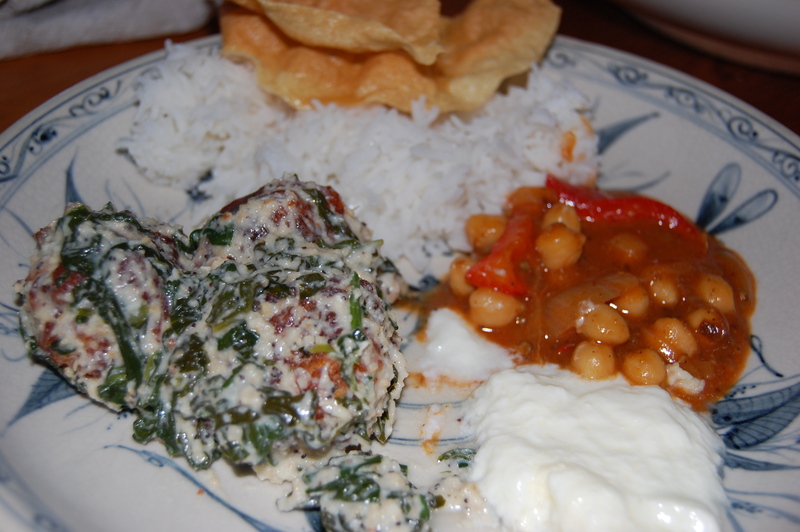 Two particular favourites were palak paneer and alu palak. In the middle of our month’s travel through the north, we found ourselves stuck in Agra for an unexpected extra night (due to thick fog and a malfunctioning ILS at the Agra airport). Exhausted from long bus rides, insouciant touts, and endless transport delays, we splurged and stayed the night at a family-run guest house near the airport called New Bakshi House (and it really was a splurge at $42 for the two of us, including breakfast and a hot shower, when we were used to paying around $10 a night). The main treat at Bakshi House, however, was not the comfortable beds or hot water, nor even the delicious home style food, but the lovely hostess, Rani, who shared her recipes with me. As I banged on about my love of palak and paneer, Rani assured me this Indian cheese was very simple to make, and gave me her recipe, as well as others for kuku, alu palak, malai kofta, ghobi, yoghurt, and another I wrote down as ‘a Chinese dish’. Although she was adamant that paneer was very simple to make, I perhaps simply wasn’t a confident enough cook yet to believe her. It in fact took me nearly a decade before I attempted to make my own. Boil 1 litre milk (her sister-in-law Tina had lived in America for 17 years, so perhaps she introduced Rani to half & half , which the original recipe called for. I use raw milk.). Add 2 tspn lemon juice. As soon as milk curdles, remove from heat. Put cheesecloth in sieve. Pour milk mixture through & cover lightly. Leave 1 ½ hours or more (you may rinse the curd at this stage if you’ve added too much lemon juice). I think that for many years I simply didn’t trust the simplicity of this operation. Surely the paneer wouldn’t form? Trust me, it does every time, just like that. I now use ordinary full cream milk, and for a family of five I find I need to do about 3L to make enough paneer for a meal (it makes about 500g). I also usually press mine as it rests in the sieve, unless I’m making paneer koftas, since I’ll be crumbling the paneer anyway. I also save the whey, which you can use if you’re making chapatis or parathas. If not, as per @crazybrave’s suggestion recently, I simply add it to the chook scraps. 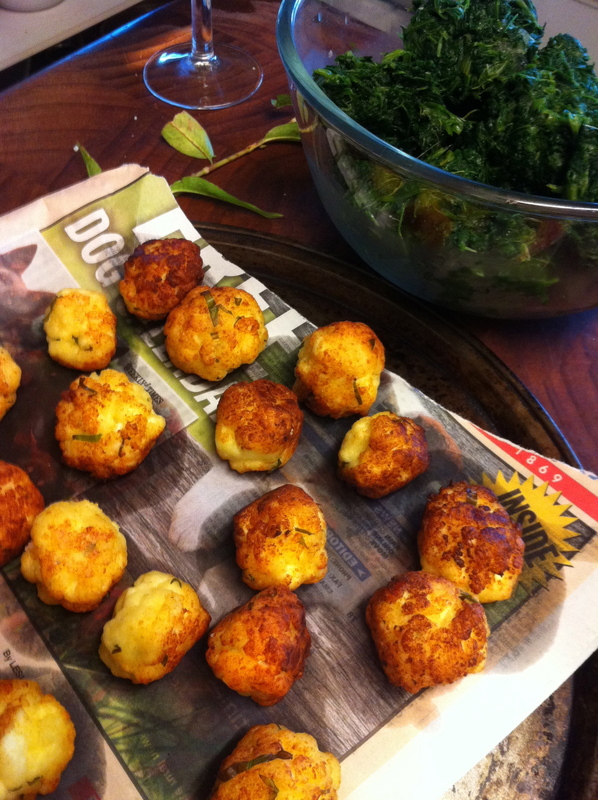 Here’s what I did with my most recent paneer, which I will usually make before lunch if I want it for dinner. This recipe is adapted from my favourite Indian cookbook, bought in Calcutta, “Desi Khana: The Best of Indian Vegetarian Cooking” by Tarla Dalal. For 500g paneer, I add about 4T plain flour, chopped coriander to taste (loads! ), chopped chilies to taste, pinch of bi-carb soda and salt to taste. Form into balls and deep fry until golden brown. Rest on paper towels. Bash up (or food process) loads of garlic, pistachios or cashews, poppy seeds (not too many as they’re bitter), ginger & chili (if no children will share this meal) – all to taste, which means lots of garlic especially in our house. Tarla adds grated coconut, but when I was short of any, I actually used coconut cream & just add it after the other ingredients fried for a bit. Chop up a giant bunch of spinach and cook it lightly with about ½ cup of water until it’s fully wilted. Blend the spinach to a puree and set aside. the garlic loses its acerbity. Add a couple of tablespoons of coconut cream and cook for another minute or two. Add about a cup of full cream natural yoghurt and cook on lower heat for another minute or so. Add the spinach puree, 1T raw sugar or jaggery, salt to taste and cook for another 3 to 4 minutes. I generally prefer not to write scathing reviews of restaurants, on the theory that everyone has a bad night, and if it happens to have been the night I came, well, bad luck for me, but it would be unfair to slam the place on one tasting. I am about to break that tradition, because the food we were served at Wild Oak in Olinda was so bad it had absolutely no place being served. To ask a diner to pay for what was on the plates in front of us was the height of egregious poor form. Two slices of tuna and pumpkin nori roll, served on a mango and red onion salsa, on top of what we think was a balsamic reduction (the waitress didn’t know). It looked like con-fusion on the plate, exacerbated by a) only having a knife and fork, and b) the fact that the rice appeared to be a solid mass. Ah, I thought, he’s being clever, and that white stuff is not actually rice. Reluctantly prodding at the roll with my fork, I managed to separate a grain of rice from the rest of the glutinous mass. Good lord, it’s rice. (Reminder: Ben teaches a Sushi Master Class.) I don’t believe you should criticise food you you haven’t tasted or books you haven’t read, so I took the plunge, and promptly wished I had a different rule about criticism. It was not just as bad as it looked, but worse, with its gluey mass of starch, tasteless filling, inappropriate mango and red onion, and totally unnecessary balsamic (?). Oh, and somewhere in there was some more starch in the form of individual corn kernels. Yuck. I cautioned Stuart to order conservatively now that we had insight into what was on offer. A waitress took our wine order and told us she was exhausted as they had catered a 60th that day for 90 guests. We commiserated, ordered a bottle of wine, and made quiet jokes about the menus in front of us, mine splattered with the detritus of someone else’s meal. I haven’t even complained yet, and they’re already spitting in my food, ha ha. And so the tapas arrived. We gazed at the plate, trying at first to discern which was the rillette and which the frittata in the dim light. Poking what was in fact the rillette with my knife, I discovered it was very difficult to actually cut through the butter on top, and insisted that Stuart experience this misery. We then proceeded to taste each item, discussing our newfound intention to simply leave, but wanting to be fair and taste the tapas. The rillette, served without any little toasts or bread, was indescribably bad. It tasted of tinned salmon, and appeared to have been sitting in a fridge for quite some time. It dawned on us that we were probably eating the leftovers from today’s function, which would explain the disastrous ‘complimentary starter’. The frittata similarly did not taste at all fresh, was cold, and was apparently devoid of seasoning. The pitted olives appeared to have come from a jar, been tossed in a mild vinaigrette and then warmed in the microwave. The pate tasted fine, but was not so much ‘en croute’ as ‘on a fluffy bit of foccacia’ & doused in a sickly sweet sauce, and the mild chorizo was okay, but served with a huge blob of rather bland aioli the texture of Miracle Whip. Time to go. I appealed to our friendly young waitress, and told her I was very sorry to put her on the spot, but that we wanted to leave without our mains. The poor thing looked politely horrified, and asked what the matter was. I gently explained that the food was awful, but that we were happy to pay for our bottle of wine and take it with us. She spoke to Ben, who all the while was working hard directly in front of me in the open kitchen. He glanced at us, after which the waitress returned and said they wouldn’t charge us for the entree, and that she was sorry. Ben didn’t come over to speak to us, nor was there an apology from the kitchen. We paid, left, and got a takeaway pizza from around the corner, which we took back to our cottage and had with our very expensive bottle of wine (it’s one thing to pay $36 for a bottle in a restaurant, another to take it away…). The pizza was pretty good. I like to think that had we waited for our mains, which would have been cooked by Ben, that they would have made up for the earlier dishes. But unfortunately, he’s allowing things to come out of his kitchen that are bad enough to drive people away without waiting to see. The extensive PR work Ben’s done on his website, with the classes, tours, speaking engagements, etc, ad nauseum won’t make up for dropping the ball in the kitchen, which is where it really counts.